☆ PIXIE | CR | Lycantrop Rec. ☆ KULU | GR | Deviant Force Rec. ☆ PHILOSO / A / Free Radical Rec. ★ ALREADY MAGED | UA | Sonic Chakras Rec. ★ ANTAGON | DE | Damaru Rec. / AliceD Rec. 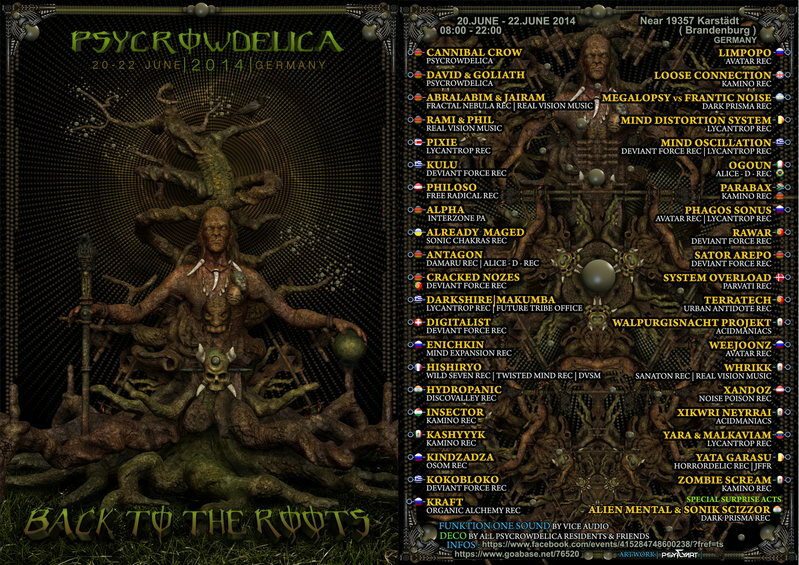 ★ CRACKED NOZES | PT & DE | Deviant Force Rec. ★ DIGITALIST | CH | Deviant Force Rec. ★ ENICHKIN | RU | Mind Expansion Rec. ★HYDROPANIC / IN / Discovalley Rec. ★ INSECTOR / HU / Kamino Rec. ★ KASHYYYK | MX | Kamino Rec. ★ KINDZADZA | RU | Osom Rec. ★ KOKOBLOKO / GR / Deviant Fore Rec. ★ KRAFT | RU | Organic Alchemy Rec. ★ LIMPOPO | RU | Avatar Rec. ★ LOOSE CONNECTION |UK | Kamino Rec./Catawampus rec. ★ MEGALOPSY VS FRANTIC NOISE | AR | Dark Prisma Rec. ★ MIND DISTORTION SYSTEM | BE | Lycantrop Rec. ★ MIND OSCILLATION / GR / Deviant Force Rec. ★ OGOUN | IT & BR | Alice-D Rec. ★ PARABAX | SA & DE | Kamino Rec. ★ PHAGOS SONUS | RU | Avatar Rec. / Lycantrop Rec. ★ RAWAR / PT / Deviant Force Rec. ★ SATOR AREPO / DE / Deviant Force Rec. ★ SYSTEM OVERLOAD | DK | Parvati Rec. ★ TERRATECH | PT | Urban Antidote Rec. ★ WEEJOONZ | RU | Avatar Rec. ★ XANDOZ | AT | Noise Poison Rec. ★ YARA & MALKAVIAM | VE | Lycantrop Rec. ★ ZOMBIE SCREAM | MX | Kamino Rec. NEW TRAVELER INFOS ! ! ! from train station Vetschau goes the shuttle to the location and back !!! shuttle transfer start Thursday 19.June 07:00 !!! free camping starts Thursday 19.June 08:00 !!!! no dogs , no children , no privat sound systems !! !